This morning started out painfully early. I woke up around 4:30 to potty. And my alarm was set for just after 5 so we could run. In other words, no point in falling back asleep obviously. But man that makes for a long long day. By 10 am, it felt more like 3 pm. We set out for the run just before 5:30. At least there was a slight breeze today. That definitely helped with the heat/humidity. I will say that our pace was just all over the place though. Zero consistency going on this morning. Our first mile was a slow one (though I thought we were going a bit faster) at 9:58, but then mile 2 was 8:31. Really? How'd that happen? I'll blame it on not being awake. And oddly, that might have been the best feeling mile for me. My legs started to get pretty heavy and I had to concentrate on my breathing. So I felt like my form was getting a little sloppy, which can make you less efficient of course. So, after a slow mile then a fast mile, so continued the varied pace: 9:19, 9:01, 8:55, 9:09, and the last half mile I missed because I didn't hit the lap button, but based on time it was around a 9 min mile. So. 6.5 miles with average 9:12 pace. I'll take it. I haven't made any sort of veggie burger in ages. Partly because I've been lazy. My original plan was to do a broiled eggplant and lentil dish that I found online. I was actually going to follow a real recipe for a change. Then I realized I didn't have enough eggplants that were ripe enough to use. So then it was on to Plan B. I had 3 decent sized Japanese eggplants from our garden that really needed to be used fairly quickly. I also had 2 baby portobello mushrooms left over from last nights dinner. 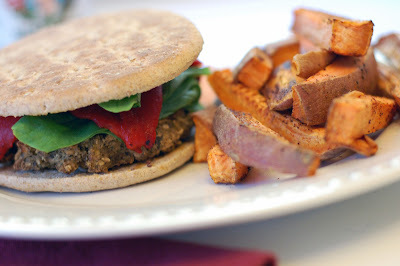 Thus was born the Eggplant Mushroom Lentil Burger. Add the eggplant, onions, and portobellos to a glass baking dish. Drizzle with olive oil and season with salt and pepper. Allow to cook for approximately 25 minutes or until softened. In the meantime, cook the lentils per package direction (I cooked up 2 cups of dried with 6 cups of water for extra lentils to freeze). Combine the remaining ingredients up to the flour in your food processor and pulse to the desired texture you prefer. Transfer to a large mixing bowl and add in the flour and flax egg. If mixture is too moist, add in additional flour as needed. Form into patties and place on a prepared baking sheet. Bake for 20 minutes then flip and bake another 15-25 minutes depending on how firm you want your burgers. This did make up 9 fairly large patties so you could reduce the recipe or do what I do and just freeze the rest.